"خدا زار کي محفوظ ڪريو!" a. ^ After 1866, Alaska was sold to the United States, but باتومي, قارص, Pamir, and Transcaspia were acquired. b. 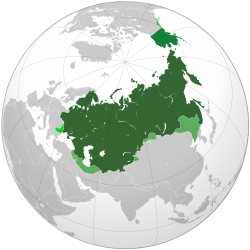 ^ Renamed سينٽ پيٽرز برگ in 1914.
c. ^ Russia continued to use the Julian calendar until after the collapse of the empire; see Old Style and New Style dates. هيءُ صفحو آخري ڀيرو 20:20، 9 جُونِ 2017ع تي ترميميو ويو هو.